I don’t have a precedent for the second anniversary of the complete obliteration by wildfire of your house and life habits. In fact, I did not have a precedent for any of the days starting two years ago on the day of the fire, June 28, 2012. That is how we came to assign 4:24 pm to the moment of our house dying. In reality it was probably a few minutes earlier but it is the minute we knew and while we believe it burned fast, it certainly took more than a few minutes to burn. There are photos on the internet that show the fire storm directly over our house. The smoke rose high into the air. We were told that the flames in the Charlotte Fire rose 60 to 80 feet. We were told it was one of the hottest and fastest moving fires on record. I don’t know if any of these things are true, every fire must have its “the worst…” aspect of it. I think being the biggest, worst, longest, wettest, driest, or some other “ist” is common and maybe even necessary when you are trying to comprehend an event that destroyed your home. Some people lose their homes and people they love. In our fire no one lost a loved one. Not even any of the people fighting the fire were seriously hurt. A couple of people suffered smoke inhalation and dehydration but in all, we were very blessed. Even a lot of the pets and animals survived. But today it is two years past that day. We created each day for two years a precedent but not one we could use the next day, yet another day without precedent. We learned from the previous day and days but each day was technically unprecedented. It is curious to me that from the moment we enter the world our life is unprecedented but we never notice that unless our expectations are challenged. We speak of unprecedented events meaning events we did not expect or events that others did not expect from us. Now that I understand life is unprecedented it is easier to think backwards to those fire-wrought hurtful days that were both unexpected and unprecedented. I can think back to the day I first thought to try to reestablish our household. I asked my sister to take me to a local box store to buy some plastic plates since I knew they were going out of season and would be marked down and then there would probably be a blanket discount too. When we arrived at the store the front display, as expected, contained all of the summer picnic and outdoor dishes. My sister suggested we look for some sales items in the back of the store where the real dishes were. She did not say real dishes, just “go look at the other stuff in the back.” Slowly she helped me pick four plates, four bowls and four mugs. Tonight I set up the coffee for the morning and put out two of those mugs. Those days were unexpected and unprecedented. Today was unprecedented but expected. We have been moving forward to this two year anniversary for months. Of course, we have been pointed toward it for two years but we have had it resting on our lives as we raced to move into our new house before today, the 2nd anniversary. Yesterday we moved upstairs from our basement apartment and started unpacking the boxes of things we acquired to replace some of what we had. We expected today to be a fine day, not one of sorrow or giddy joy. It was a fine day. It was a quiet day. We slept in, me more than my spouse. Our dog slept in on our new bed as if it had been her bed forever. After we worked on boxes and moving rugs around trying to see who fit where, we found ourselves upstairs with a rug well placed and tired and hungry. I said I would like to rest while my spouse went down to the basement where the “more here than that new one” kitchen and made us a bowl of soup and brought it all the way back up stairs. Because we only have a bed for furniture upstairs right now, we rested on the bed and ate our soup. Afterwards I was reading and my spouse resting. A bit later I woke up and he was still napping. Later he awoke and we just lay peacefully there appreciating the cold, wet, summer rain wind that blew in our windows. In a while I looked at my phone and it was 4:20. I glanced a bit later and said quietly, “It is 4:24.” And it was gone. A touch of hands and a simple shared moment and we both fell asleep again. Tonight we had a celebration dinner. We decided on steak, asparagus, champagne, and chocolate cake. My spouse said he would get a slice of the rich specialty chocolate cake we sometimes splurge for. I said, “No, I meant a whole cake like with a candle and all. 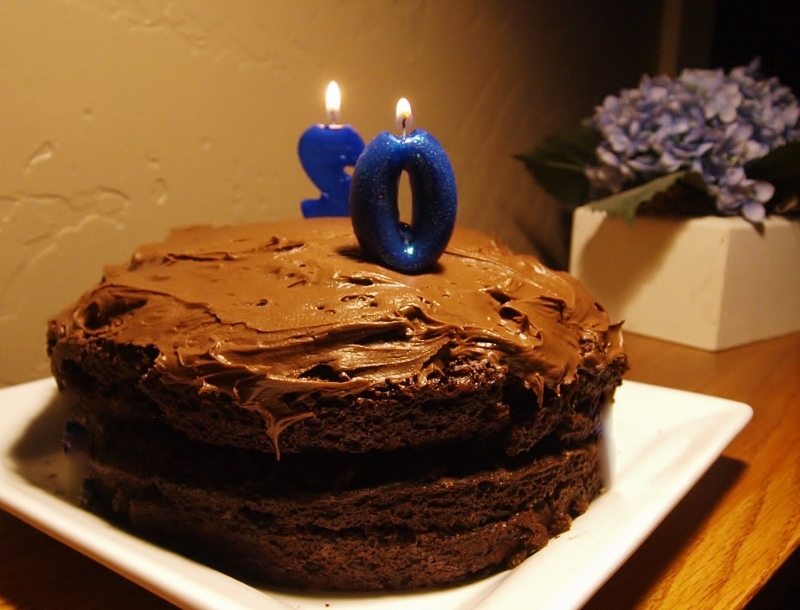 In fact we could make one, we can make things now, we don’t have to buy stuff already done.” We made a chocolate cake. It was a box cake but it cooked in our oven in our pans and was served on our plates. My spouse brought two candles. 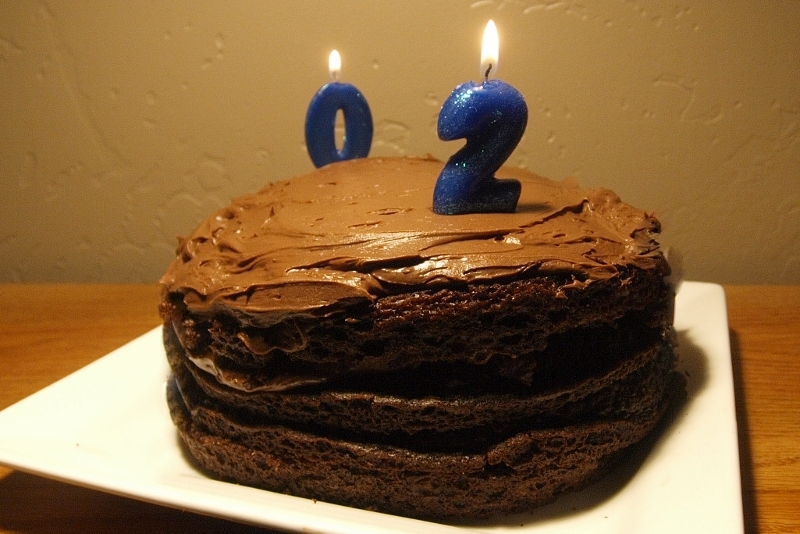 One was a 2, for the second anniversary of the fire and one was a 0 for the start of our anniversaries here in this new house. While I barbecued our steaks in the twilight evening of the soft, damp day, I looked up and there was a rainbow. I called my spouse to bring the camera and then a second rainbow appeared. The link between our two houses is complete. 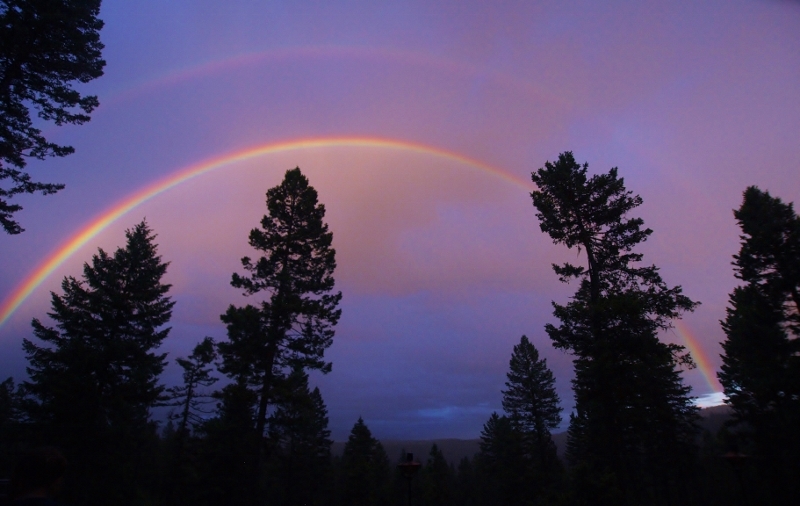 The rainbows at our Idaho house were spectacular and we had many photos of them. The rainbows at this Montana house are spectacular and we will have many photos of them. Both of our homes have been the pot of gold at the end of our rainbows. Congratulations and Blessings !! Beth, Hank and Sweet Sophie !! !